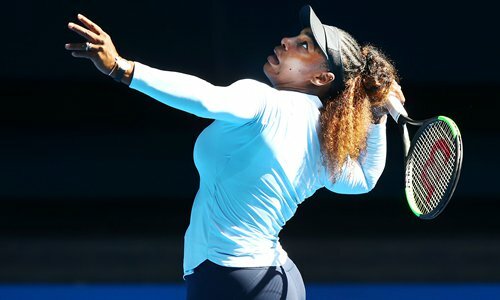 Serena Williams is back in Melbourne as hot favorite to repeat her 2017 Australian Open win and claim a record-equaling 24th Grand Slam with rivals, including defending champion Caroline Wozniacki, battling health issues and poor form. Williams won her 23rd title and seventh at Melbourne Park while eight weeks pregnant two years ago, and now attempts to match Margaret Court's mark of 24 singles majors on the Australian's home soil. Her 2017 triumph Down Under gave Williams the outright open era record for singles majors ahead of Steffi Graf's 22, leaving only Court's tally of 24 titles - 13 of which were earned in the amateur era before 1968 - for Williams to chase. Williams missed her first chance to match Court when losing last year's Wimbledon final to Angelique Kerber, and said ahead of the Australian Open that she was taking nothing for granted. "It's something that I clearly want but I have to be able to get there and beat a lot of good players to get it," the American said. Regarding the controversial final against Osaka at Flushing Meadows - when she raged against umpire Carlos Ramos who imposed three code violations, the final one resulting in the loss of a game - Williams said she had put it put behind her and intended to "move on to bigger and better things." Bookmakers in Australia have installed Williams as a short-priced favorite for the title with her US Open conqueror Osaka - the first Japanese player to win a Grand Slam - next in the betting. She warmed up for Melbourne by making the semifinals of the Brisbane International last week, where she blamed a poor attitude for losing to Lesia Tsurenko. "I feel like last year I did a lot of that," she said. "I'm trying to change it more, and I think I have." While she is the leading light for the next generation, the world No.4's status as second favorite points to a lack of serious rivals for Williams among the more established players. Wozniacki, ranked three, started last season by winning her first Grand Slam in Melbourne and returning to world No.1, but ended it in October with the bombshell announcement that she had been diagnosed with rheumatoid arthritis. Wozniacki proved she can still compete by winning in Beijing in October but whether she can cope with the gruelling two-week slog of a Grand Slam remains to be seen, and she was bundled out of the Auckland Classic last week in Round 2. World No.1 Simona Halep of Romania comes into the tournament under a fitness cloud after a nagging back injury curtailed her 2018 season. Two-time major champion and former No.1 Garbine Muguruza was another who had an injury-blighted 2018 which saw her drop out of the top 10. But the 20-year-old Aryna ­Sabalenka from Belarus has zoomed up the rankings from 73rd at the start of 2018 to No.11 on the back of tournament wins in New Haven and Wuhan, and is a dark horse to emulate Osaka and achieve a maiden Grand Slam.